If you’re looking for a simple and quick dinner in no time, stop right here! This dish uses garden-fresh zucchini as noodles. ZOODLES! How cool is that?! I just bought a veggie spiralizer, and I can make almost any veggie into pasta. And if you don’t have a spiralizer, you can use a mandoline to slice the zucchini into long strands, or use your kitchen knife to chop them into noodles. Either way, paired with juicy chicken breast, spicy jalapenos, fresh lime juice and cilantro, you can’t go wrong! Try it out as dinner and be sure to make extra for tomorrow’s lunch. Heat 1 Tbsp. oil in large skillet on medium-high. Add jalapeno and chicken and saute until chicken is golden brown, stirring occasionally. Stir in cumin, salt and black pepper. Transfer to a bowl and set aside. Add remaining oil and zucchini noodles and saute an additional 1-2 minutes, until zucchini starts to soften. 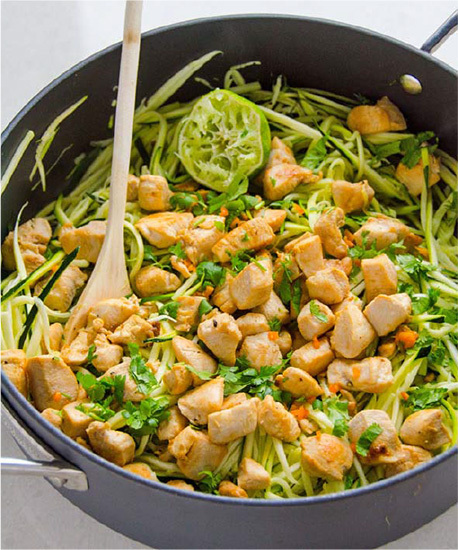 Add chicken mixture back in the skillet with zucchini noodles and stir in lime zest and juice and cilantro. Taste and adjust seasoning, if necessary. Serve! 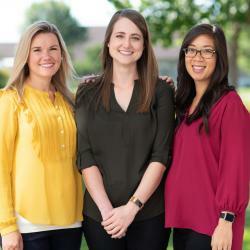 Julie Andrews is a Registered Dietitian Nutritionist (RDN) with Festival Foods and is certified by the state of Wisconsin.